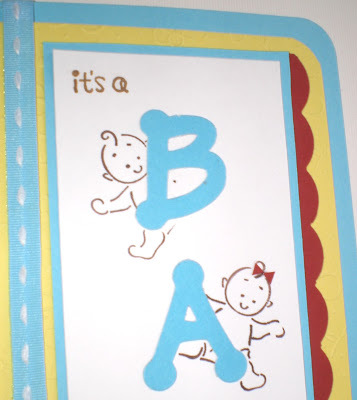 This is my entry as well as my card for my friend Rachel who is having a baby Boy! I wanted to make it special and just for her. 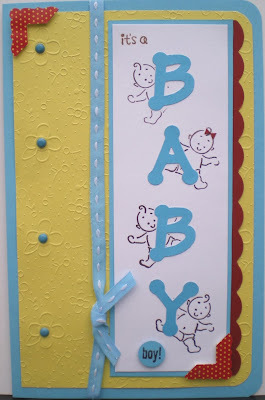 I loved using the masking technique for the babies and letters as well as the embossed paper for the contrast. I made it a larger card because his momma...being rather crafty herself is not only going to put it on a scrapbook page...but she is making a little book of greetings and well wishes, from all her friends and family, for her little one and wants to use it as a cover for it! Cool idea Rachel! The neat part about this?...is that while I was creating the scalloped edge with my corner rounder (with the guard off) two small pieces of red triangles fell onto my page...right next to this little baby...I guess SHE wanted a bow for her hair! lol! This was so much fun! What a great way to spend National Scrapbook Day! So adorable :) Love those babies!